the second rank holder (Commerce) at the Goa University in 2014. Presently a CA student, she is writer, poet, self-taught artist and a person of many other talents.“Art for me is not truly an escape from reality, but a way of meditation that allows me to have a balance of inner peace and calm in a loud world,” says Leandra. She is enchanted by acrylic paints, abstract expressionism, impressionism and also a little of contemporary art. Leandra loves working with textures and mixed media works. She has realised that every artist has a unique sense of creativity, some good at certain mediums and types of art. “My work is mostly nature inspired or music related – like trees, forests, leaves, flowers or instruments. There’s something truly magnificent about nature and music, both soul rejuvenating,” she informs. Curchorem-basedSunil Kakodkar is a doctor and an occupational health expert. He pursued his career in medicine for more than 30 years, before taking a break from professional work in 2016. Sunil, a self-taught painter, has had two successful art exhibitions earlier, namely ‘Medicine for the Soul’ at Carpe Diem Art Gallery at Majorda along with Dr Sophia Rodrigues in September 2017 and then ‘heArt and Soul’ at Kala Academy, Panjim, along with Suyash Tanawade and Ashlesh Kamat in April 2018. 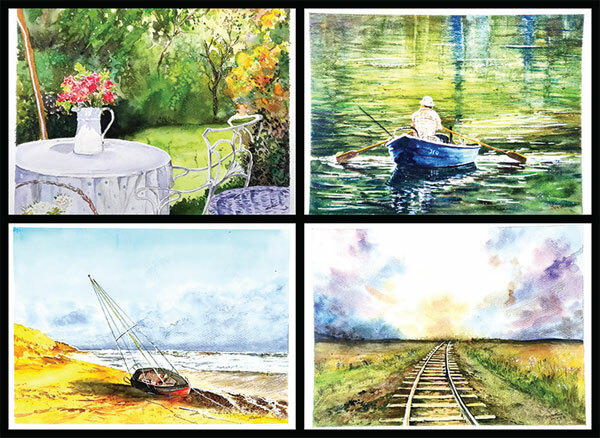 “The transparency and fluidity of watercolours have fascinated me ever since I saw them being used by my friend in my childhood years; I would dream of creating beautiful and serene landscapes in this medium,” he informs. “As time passed by, professional obligations overtook the artistic impulse,” he adds. Speaking about the themes he chooses, he says, “Nature’s beauty inspires me. My work is mostly landscapes inspired by the colours and mystery of beautiful locales,” he says. The two artists will be bringing their works together for an exhibition, title, ‘Abstract Reality’, at Black Box, Ravindra Bhavan, Margaofrom December 6 to 8, 2018, 10 am to 7 pm.